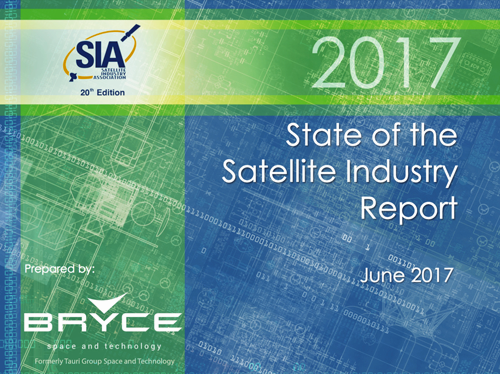 The Satellite Industry Association (SIA) has released their 2017 State of the Satellite Industry Report at an industry briefing held in Washington, D.C.
For 20 years, SIA has been publishing the leading analysis of the satellite industry. The industry report, produced by Bryce Space and Technology, LLC, is derived from proprietary surveys of satellite companies, in-depth public information, and independent analysis which are combined to assess the performance of key satellite industry sectors including satellite services, ground equipment, launch services and manufacturing. The 20th annual report shows continued growth in the overall industry, with global satellite revenues increasing by two percent during 2016 to just over $260 billion. Satellite services remains the largest industry segment with consumer services including satellite TV, radio and broadband remaining the primary revenue generator — however, global Earth Observation (EO) and remote sensing services revenue showed significant growth increasing by 11 percent. Satellite ground equipment revenue also grew by seven percent year over year led by satellite navigation and chipset sales supporting location-based services and devices. During the year, the growing importance of the industry was once again underlined by the continued increase in the sheer number of operational satellites in orbit and by the announced plans for new satellites with increased capabilities as well as multiple constellations. By the close of 2016, 1,459 satellites were operational compared with 1,381 at the end of 2015. This represents an increase of 47 percent over the past five years. Satellite Services revenues remained as the largest industry segment and were consistent from 2015 to 2016, reaching $127.7 billion, powered by consumer satellite television, satellite broadband and Earth observation services. Satellite Ground Equipment revenues rose by seven percent over 2015 to reach $113.4 billion. Satellite navigation (GNSS) equipment for both consumer and industrial customers now includes the entire GNSS segment: stand-alone navigation devices and GNSS chipsets supporting location-based services in mobile devices; traffic information systems; aircraft avionics, maritime, surveying, and rail. For more information regarding SIA’s State of the Satellite Industry Report, please contact Charity Weeden, Sr. Director of Policy, SIA, at cweeden@sia.org.